It's always interesting to see what happens when a chef from a local restaurant chain branches off to start their own venture. 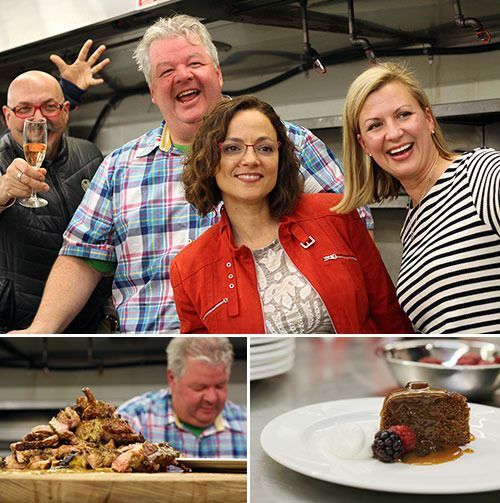 A well-known Edmonton chef recently did just that, and you know who I'm talking about: Chef Paul Shufelt! After ten years as Executive Chef for the Century Hospitality Group, Chef Paul Shufelt decided it was time to start up a restaurant of his own. 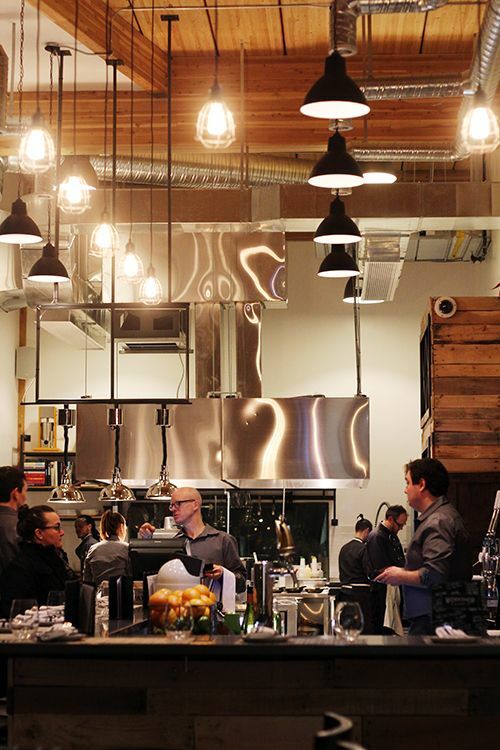 The Workshop Eatery officially opened a couple weeks ago in The Mosaic Centre, Canada's largest net-zero commercial building. Choosing to open up in a sustainable building definitely poses its challenges, but supporting local producers, sustainability, and using seasonal produce are concepts important to Chef Paul. So what does this all mean for The Workshop Eatery? For starters, the restaurant will grow a variety of herbs and vegetables in the outdoor planter boxes when the weather permits. 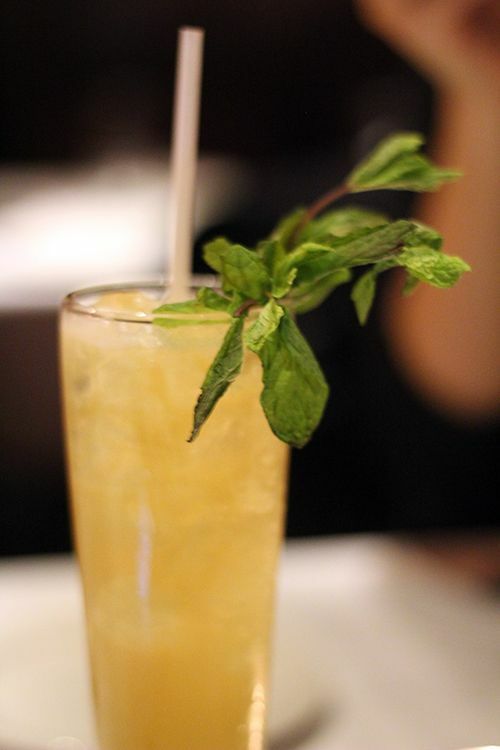 The rooftop is also home to honeybees, and the honey is collected and utilized in the dishes on the menu. The idea is to use ingredients at their peak for best flavour, and they can also be preserved as pickles and jams for use throughout the year. In the seasons where ingredients cannot be grown or are unavailable, they will be sourced from producers in the local area. Having a home in an environmentally conscious building has definitely shaped the concept for this restaurant! The Workshop Eatery is located in the far south neighborhood of Summerside, which can be a fair drive for many in Edmonton. But once you enter the building you're greeted by an open space and living wall, which shows how unique and beautiful the Mosaic Centre really is. As for the restaurant, you're greeted into a space that is warm, rustic and inviting. I love the open concept and the visibility of the kitchen - there's nothing to hide! 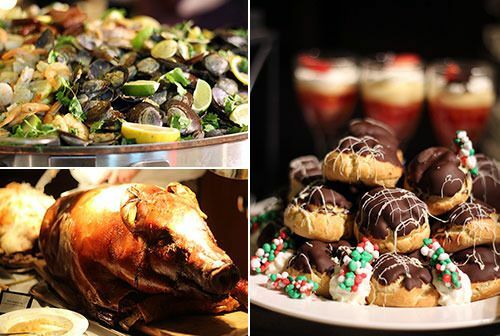 Throughout the different seasons, the menu will consist of roughly 20 staple dishes and a different feature each day. 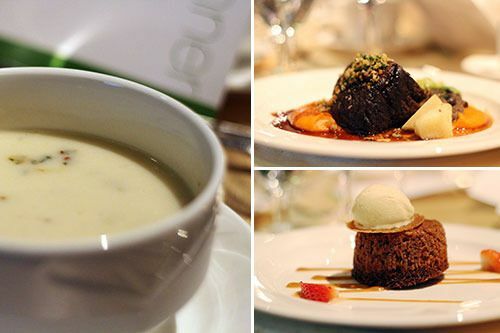 What makes the menu seasonal will be the different accompaniments and sides to a main dish. 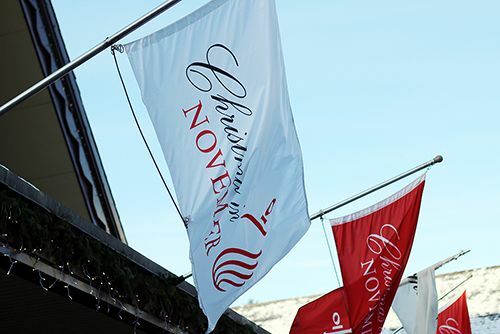 If you're ever wondering what's on the menu on a particular day, just check the website! It's amazing that they will be updating their online menu daily! We started off our meal with a couple of appetizers, first up was the Arancini ($12). The arancini at Workshop changes daily, and the "New York Deli" arancini with deli meats, a balsamic tomato smear, and Nefiss Lazizz Olive Oil was the feature for the day. These fried risotto balls had a golden, crisp exterior, and broke open to reveal a creamy mix of risotto, green peas, and small morsels of meat. I personally prefer my arancini to be rich and cheesy, so these arancini didn't quite deliver for me. 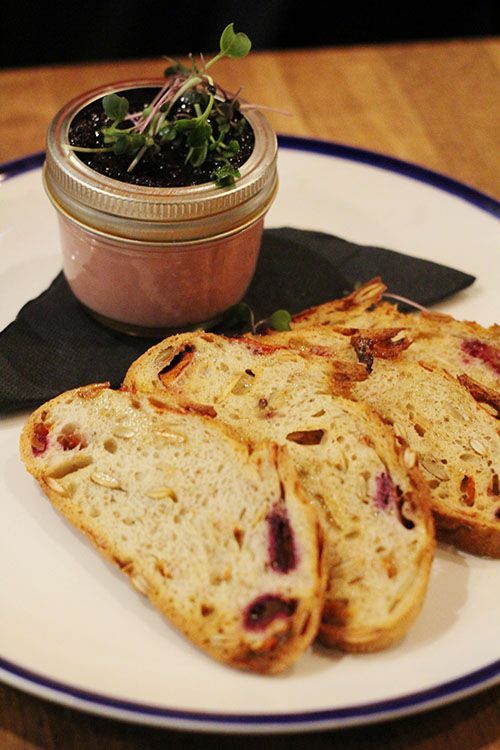 Next up came the Chicken Liver Parfait ($11) served in a small mason jar with crostinis made from Bon Ton Bakery's Cranberry Raisin Nut Bread. The liver was whipped with a mousse-like texture and topped with a port and Saskatoon berry jam. It was a perfect balance between sweet and savoury, and I loved the different textures that the crostini added to the mixture. Our last starter for the meal was the Duck Carpaccio ($17) featuring Moosewood Acres cured duck breast, pickled shiitakes, carrots, daikon, a soy reduction and blood orange vinaigrette. I really enjoyed the fragrant orange paired with the duck, and the tang of the vinaigrette, but found that the dish was much too salty. 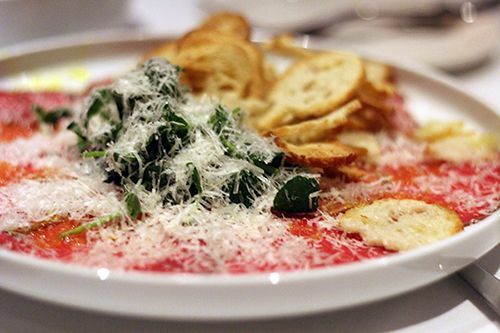 Typically a carpaccio dish features meat that is extremely thinly sliced or pounded thin, but the duck in this carpaccio was thickly sliced. The thick slice combined with the soy reduction was quite salty, so with some adjustments to the cut and seasoning, I would really enjoy this dish! 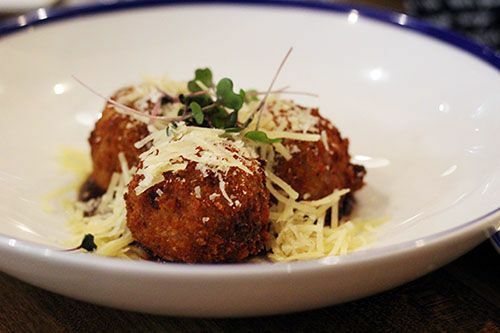 Just like the arancini, The Workshop Eatery has a feature dish each evening. 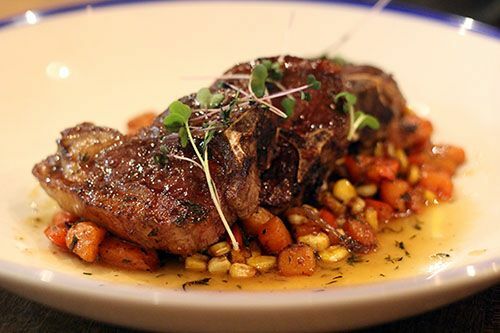 On the night of our visit Tangle Ridge Lamb Chops were being served with a butternut squash, corn and bacon hash. The lamb chops were moist and tender, and looked beautiful against the brightly coloured hash. The hash itself was naturally sweet but lacking in smokiness which we expected from the bacon. As it turns out, we didn't find much bacon in the hash either, so that could have accounted for the discrepancy. For myself I ordered the Duck Duck Couscous (how fun is that to say?!) 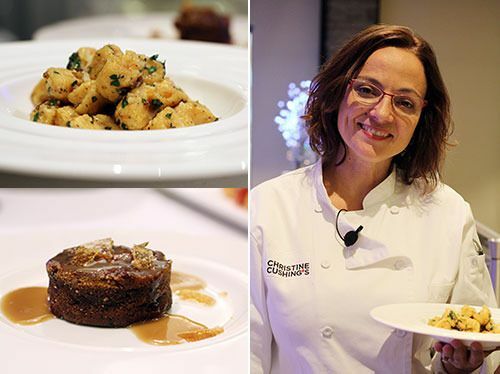 ($32) which featured beautifully seared Moosewood Acres duck breast on a bed of warm couscous with raisins, almonds, pickled cherries and vanilla parsnip puree. 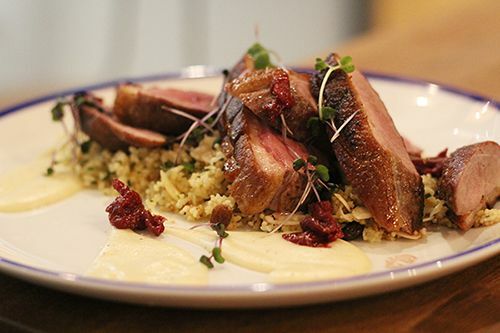 The duck was cooked to a perfect medium, and the lightly sweet couscous was a great companion to the duck. The parsnip puree was also a delightful addition to the dish, and complemented both components on the plate. Although I love lamb, the duck was definitely the winner for me and I would happily order it again. When it came down to the desserts, I was torn between two options. The panna cotta at The Workshop Eatery is made with the rooftop honey and would have been my first choice, but I couldn't resist the Croissant Bread Pudding ($9). The flaky croissant pieces are paired with white chocolate and cranberry, giving this dessert some tart notes to balance the sweet. 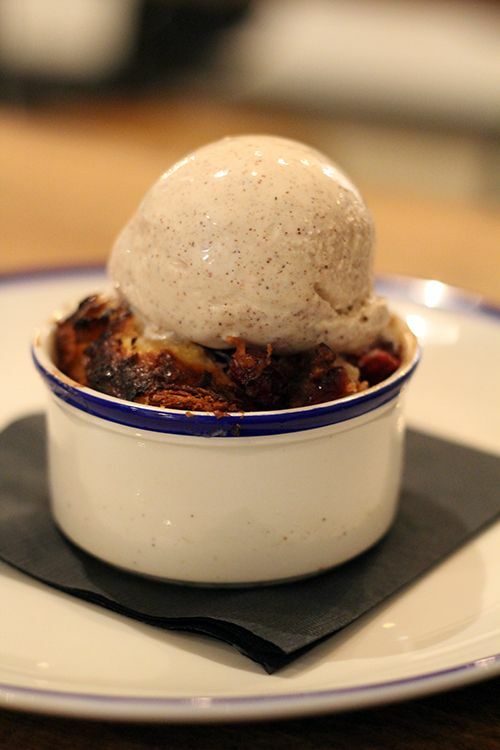 Topped with a generous scoop of Pinocchio's cinnamon ice cream, this was a comforting dessert that I would eat again. 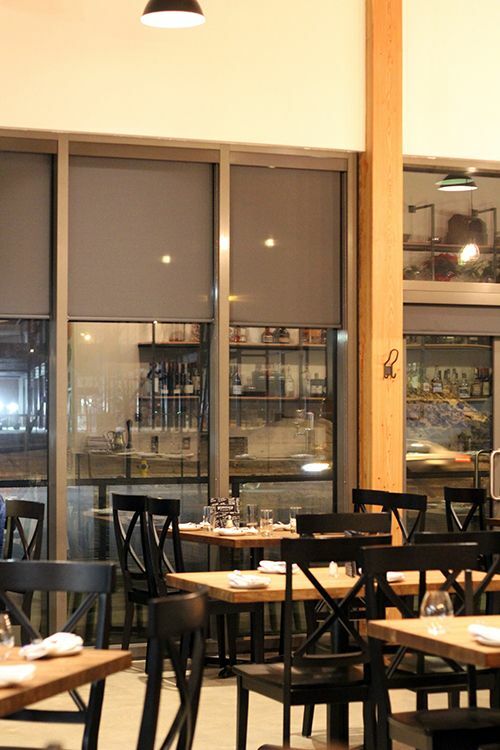 Taken as a whole, we had a great dinner at The Workshop Eatery: our dishes were good and the service was attentive. If there's one thing I love about The Workshop Eatery, it's their commitment to sustainability and supporting local producers. Their decision to move into the Mosaic Centre means that the drive to their restaurant is long and far for many patrons, but the principles of the building align with the values of the restaurant. It's great to see so many local farmers mentioned throughout the menu, and I think it will be interesting to see how things shift once the growing season in Edmonton comes around. Given that The Workshop Eatery is an advocate for supporting local, the prices on the menu reflect the higher cost of the ingredients, as appetizers range from $9-$17 and main dishes run $24-34. It's not going to be the neighborhood restaurant you visit for dinner everyday, but it is a nice option for celebrations and get-togethers for those living in the immediate area. With lunch options and brunch on the weekend, I'm sure The Workshop Eatery is a welcome addition to Summerside. 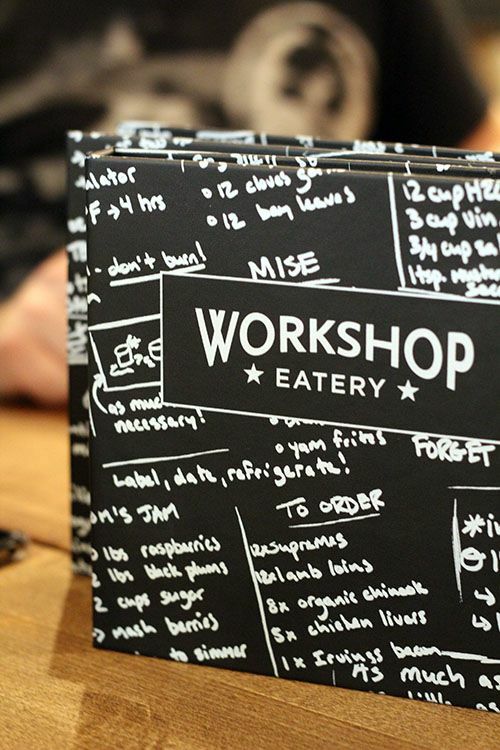 *Disclosure: I was invited to try The Workshop Eatery as media to sample the new menu. Views expressed in this post are solely mine. This post is 100% my opinion, and as always, my priority is to you, the reader, to present an unbiased, thorough review. Edmonton is a growing city and the suburbs have been a popular place for couples to move and start their families. 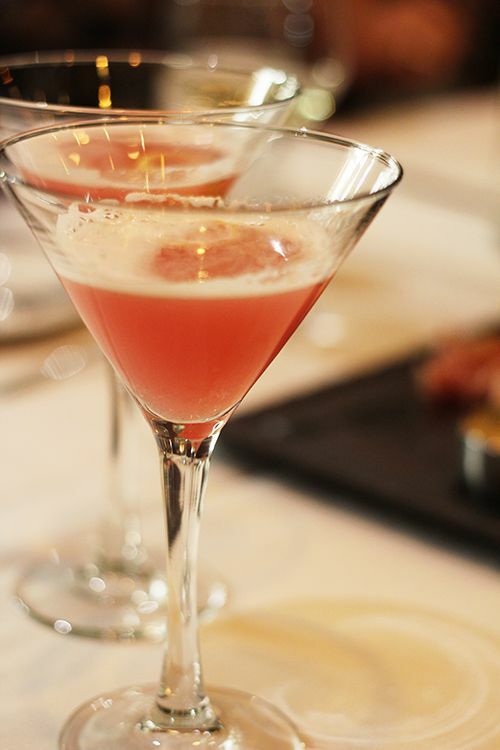 Dining options are typically restricted to chain restaurants and fast food establishments, but if there's one local restaurant that has proven that fine dining can thrive in the suburbs, it's XIX Nineteen. 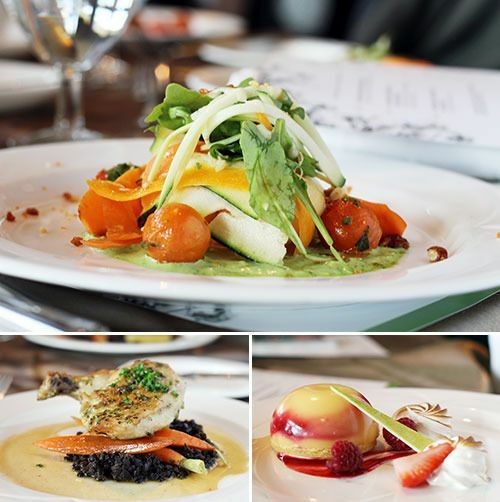 XIX Nineteen is a popular destination for diners in the Terwillegar/Windermere area of Edmonton, and for good reason: the food and service are always top notch. After three successful years in Edmonton, Nineteen has expanded to a second location at the Shops at Boudreau in St. Albert. The restaurant space in St. Albert is similar to the location in Terwillegar, where a brightly lit (and incredibly clean!) open kitchen allows diners to watch the kitchen team expertly prepare plates for service. Modern accents complete the decor, giving the restaurant a chic, upscale feel. So how does St. Albert differ from Terwillegar? 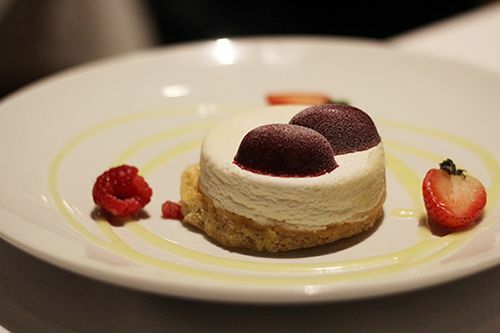 Aside from a slightly different menu, diners are in the hands of Head Chef Rino Lam, a graduate of the NAIT Culinary Arts program and certified Red Seal Chef with over 15 years of culinary experience. I had an opportunity to preview the menu, and I was excited to see what Chef Rino had in store for us. 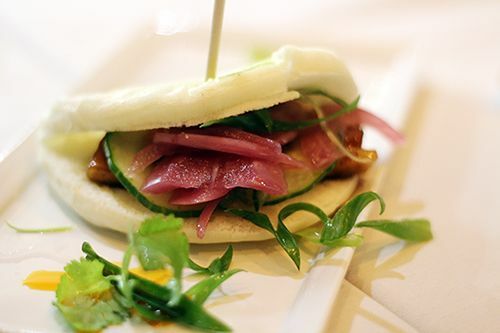 The evening kicked off with the Irving's Farm Pork Belly "Fung Bun" ($14), where citrus soy-glazed pressed pork belly, pickled red onions, cucumber and green onions are folded into a Chinese-style, soft steamed bun. The acidity from the onions cut the fattiness of the pork belly nicely, and the sweet and salty balance in this dish was perfect. I really wish more restaurants would serve buns! 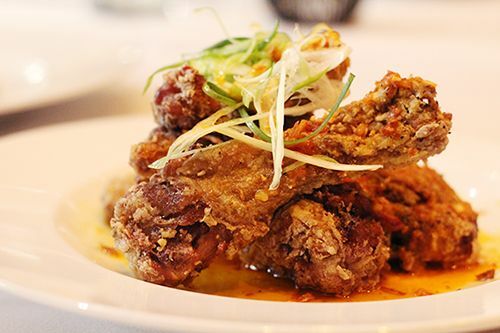 The Garlic Quebec Duck Wings ($15, lounge menu only) can be done two ways: with spicy honey garlic sauce or fried garlic, shallot, scallion, and chili flakes. Our wings were done with the latter, and they were delicious! The crispy coating gave way to fragrant confit duck wings with a kick of heat. 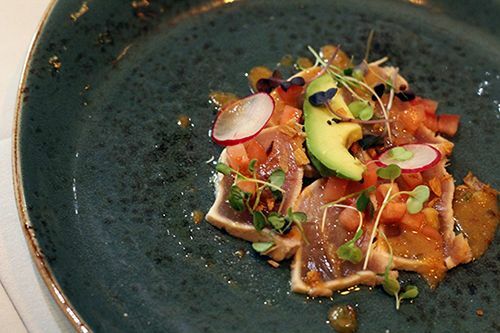 An individual portion of Nineteen's Spicy Miso Albacore Tuna Tartare ($17) came next, dressed with avocado, tomato, deep fried garlic, shaved radish and a spicy miso dressing. The tuna was fresh and well seasoned, but I think what I loved the most was the beautiful pops of colour on the plate! 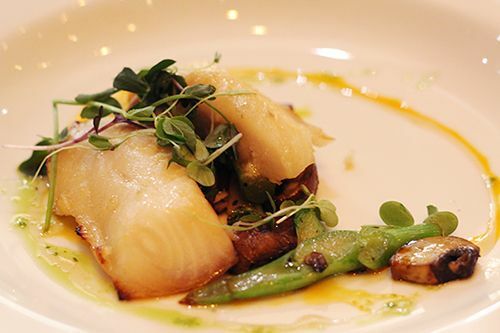 When it came time for the mains, a delicate Miso Marinated Sablefish with wild mushrooms and rapini made it's way to the table. 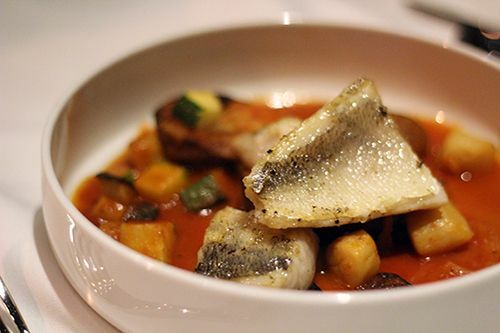 The buttery fish was cooked perfectly and would be fantastic for anyone looking for a lighter main dish. Unfortunately it isn't currently on the menu, but I hope it makes it there! Everyone was in for a treat when the Alberta AAA Beef Tenderloin ($38) hit the table. 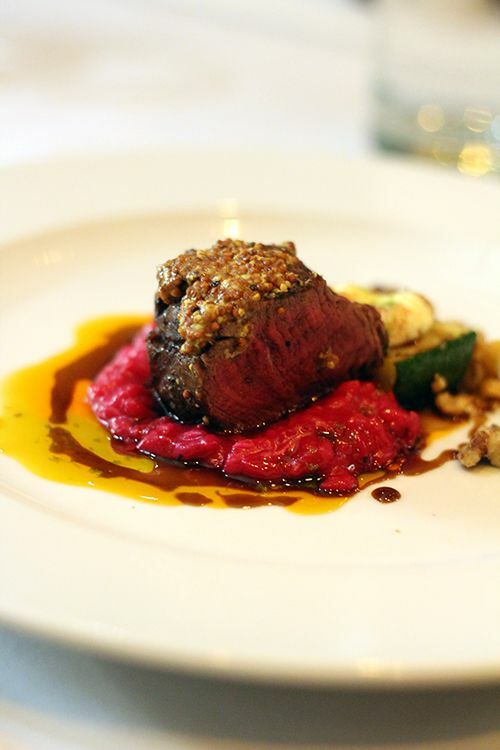 Sous vide and seared to a beautiful medium rare, the premium cut of beef was served with a vibrant beet risotto, Quebec goat cheese crusted zucchini, walnuts, and baby arugula. We were absolutely spoiled when it came to desserts as four different offerings were placed on the table. 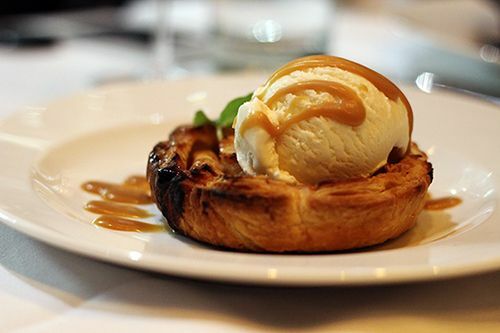 First up was an apple pie complete with a deliciously crispy, flaky crust and a generous scoop of vanilla ice cream. The pie wasn't overly sweet and would be a great finish to a meal! Next up came a warm brown butter cake, again with a big scoop of vanilla ice cream. This is for those that love digging into a slice of cake while it's still warm! 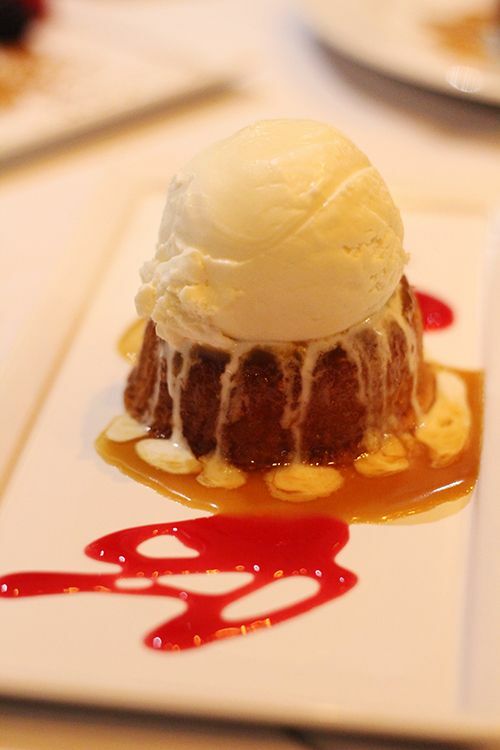 The cake is warm, moist, and tasted great combined with the ice cream and caramel sauce. 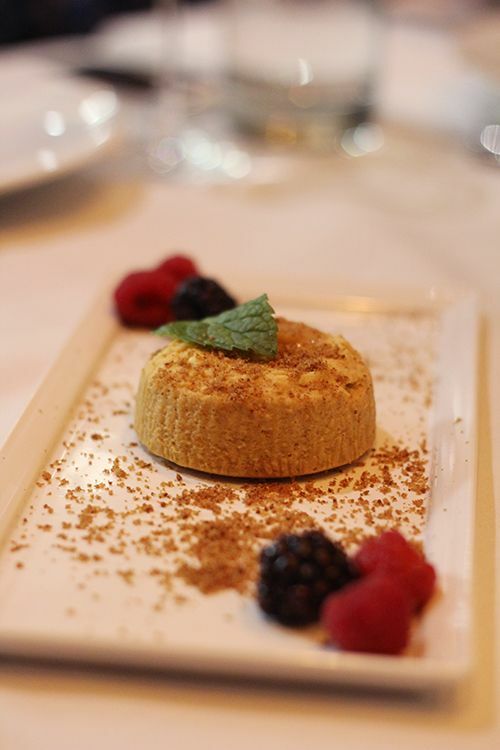 Since it doesn't quite feel like "real winter" yet, Nineteen's dessert menu features a light pumpkin cheesecake dusted with graham crumb. The pumpkin is subtle, but what I liked about this cheesecake was the lighter texture. 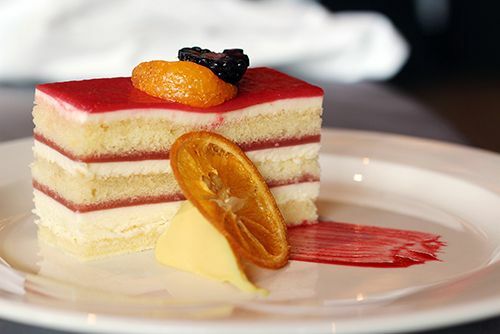 Without the density, it ends up being a cheesecake that isn't too rich after a heavy meal. 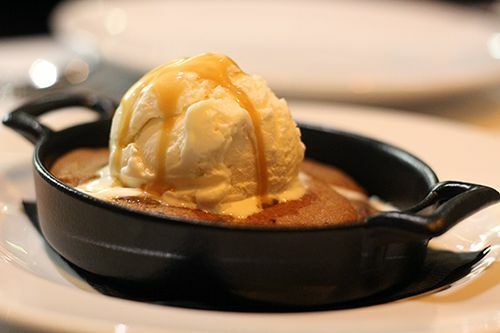 Last but not least came the Pizookie (below) - Nineteen's pizza cookie! Served straight from the oven in a sizzling hot skillet, this is everything that a chocolate chip cookie should be! Warm (read: hot!) from the oven, gooey, chocolatey, and served with ice cream. 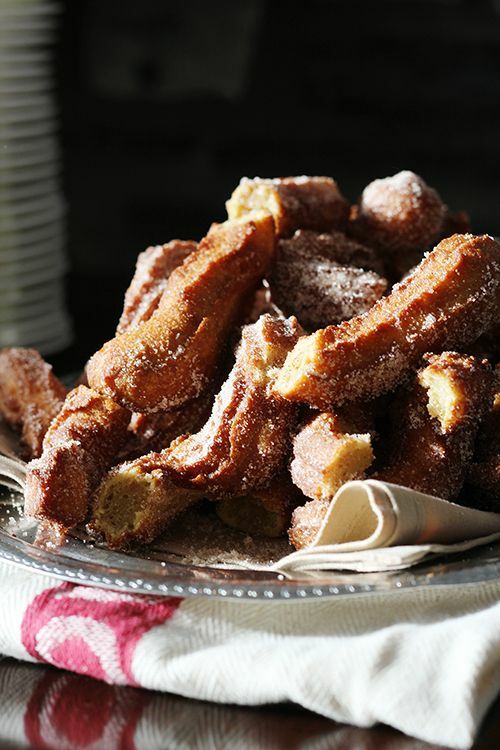 It's a sinfully rich dessert that is definitely worth all the calories. It's great to see local restaurants succeed and it's awesome that Nineteen has been able to open up a second location. 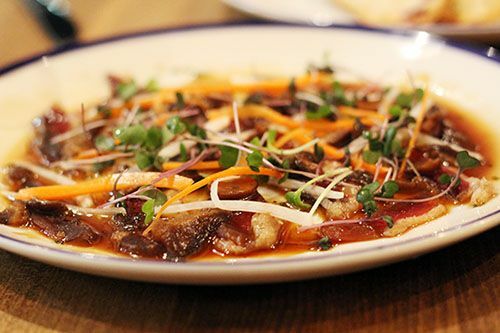 I can't even count how many times I've heard people complain that Nineteen is too out of the way for them to visit, so hopefully this new spot in St. Albert can entice some Edmontonians to finally have their first taste of their Asian-inspired Canadian cuisine. The menu is definitely on the pricier end of things, so while Nineteen isn't a restaurant to visit everyday, it's a great spot for celebrations and special date nights. 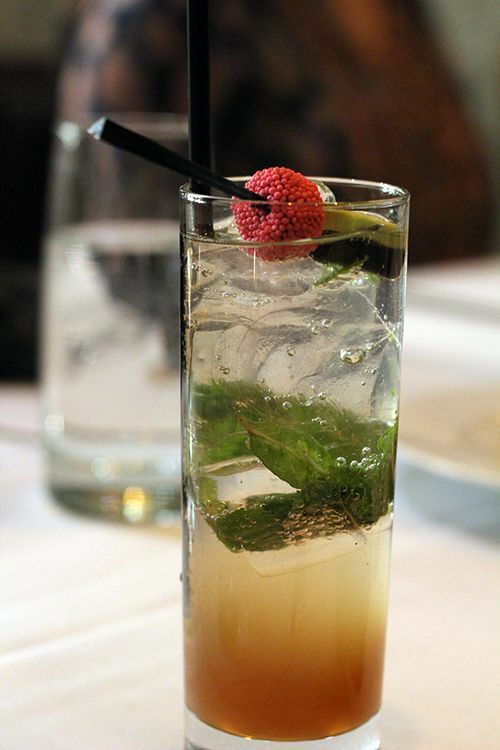 For those looking for something more budget friendly, Nineteen's lounge offers happy hour specials from 3-6 PM daily, so you can try cocktails and appetizers at a fraction of the cost. This location in St. Albert also hosts brunch on Saturdays and Sundays from 9AM - 2PM. 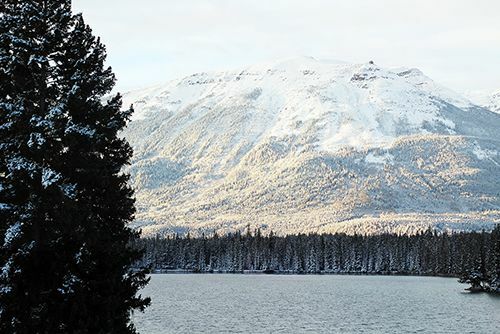 Even though the Terwillegar location is a 5 minute drive from my house, I'm definitely interested in making the drive to check out their brunch offerings! A big thank you to Chef Andrew Fung, Chef Rino Lam, and the team at XIX Nineteen for the great food and service, and congratulations on opening your second location! 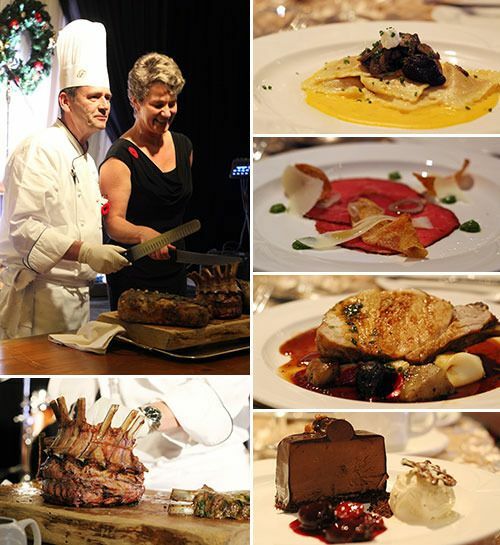 *Disclosure: I was invited to XIX Nineteen in St. Albert to sample the new menu. Views expressed in this post are solely mine. This post is 100% my opinion, and as always, my priority is to you, the reader, to present an unbiased, thorough review. 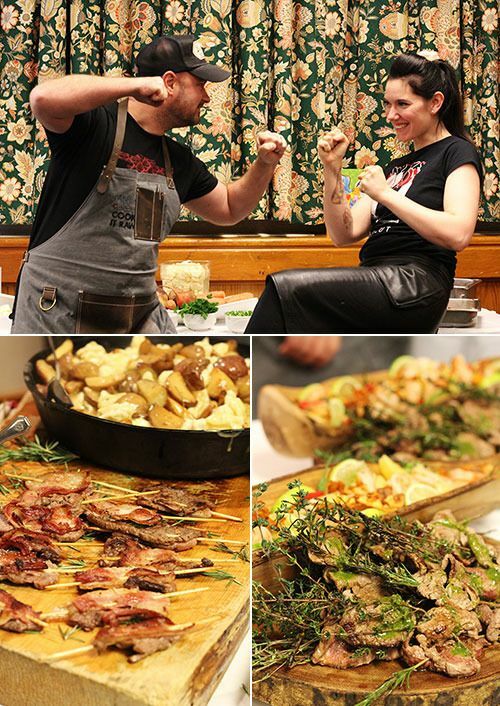 When Tavern 1903 in the old Alberta Hotel suddenly shut down this year, Edmonton's food scene lost a great restaurant. As the space lay empty, everyone wondered what it would be converted into. 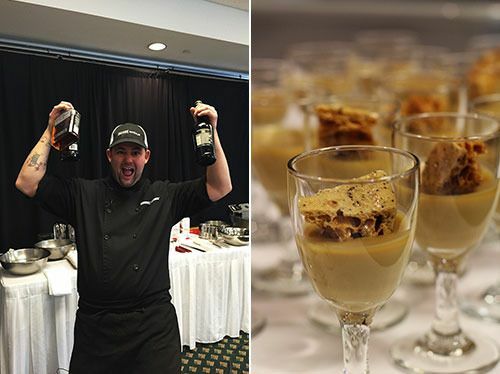 When it was announced that Chef Spencer Thompson of Toast Fine Catering would be opening his first restaurant in the space previously occupied by Tavern 1903, I was pretty excited. Toast Fine Catering is a permanent vendor in the Old Strathcona Farmers Market that serves up breakfast and brunch options for market-goer's every Saturday morning. 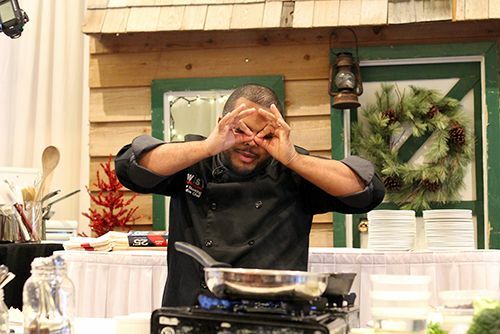 I've never had a bad breakfast there, so I was looking forward to seeing what Chef Spencer had up his sleeves. 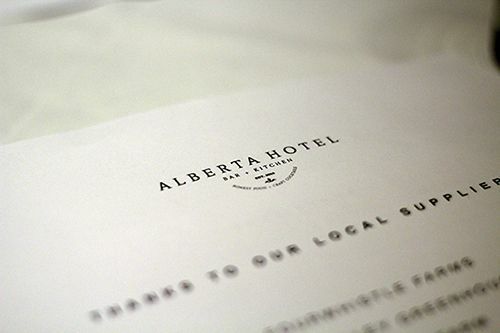 The Alberta Hotel Bar + Kitchen had a three week soft opening prior to their grand opening on November 19th. I booked a group dinner with my friends for my birthday this year and we were all looking forward to trying out the entire menu. For our group of 15 people, I was surprised upon arrival to find that we had been split into four separate tables. Normally this wouldn't be an issue, but with one dedicated server to our group (she was lovely!) the service was very disjointed. As the first table was receiving their food, the fourth table hadn't even made their order yet, so instead of being served as a group, we were served as four separate tables that weren't dining together. Just something to take note of if you're planning on making a reservation for more than 6 people. Now onto the food. The Alberta Hotel Bar + Kitchen promises diners an authentic experience - honest, transparent, and uncomplicated. The menu features many local producers - likely due to the relationships that Chef Spencer has developed over the years with vendors at the farmers market. The offerings are fairly concise and include options for diners with vegetarian or gluten free diets. General Manager Brandon Baker (previously of Three Boars) is the mind behind the cocktail menu which has a handful of cocktails he crafted himself. My table started the evening with a couple appetizers, and first up was the Warm Mushroom & Lobster Salad ($18). 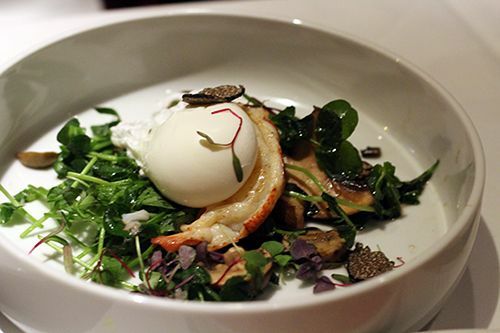 The salad was presented beautifully with pea shoots, crimini mushrooms, a hefty chunk of lobster, a poached egg, and shaved Italian truffle. The components were fresh and the mushrooms flavourful, but the salad itself wasn't too exciting. Next up came the Beef Carpaccio ($17) sliced paper thin and finished with a drizzle of cold pressed canola oil, pea shoots, and shaved pecorino. It was nice to see the kitchen using pea shoots rather than arugula (as many do in this dish), since it brought on a different dimension of flavour. Unfortunately the dish itself was underseasoned, and a bit of salt and pepper could have gone a long way. 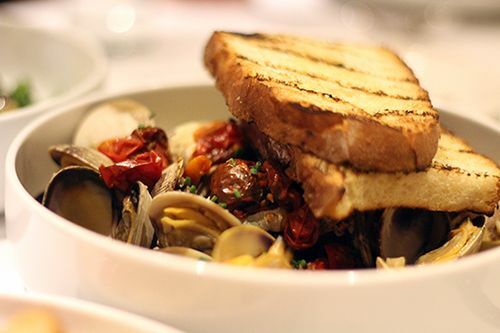 The Steamed Manila Clams ($16) arrived in a heaping pile, served in a light broth with heirloom tomatoes, garlic, lemon and crostinis. The clams were fresh, and the light, savoury broth highlighted their natural sweetness. The dish had great value given the portion size, and was perfect for sharing among the table. 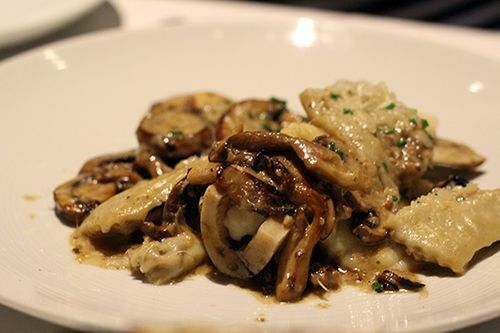 We also had an order of the Bone Marrow Agnolotti ($16) cooked in brown butter and served with wild mushrooms, celery root puree, and shaved pecorino. Agnolotti are delicate pockets of pasta, and those that arrived at our table had burst open, with their contents spread widely across the dish. While the dish didn't quite have the best presentation, it was the most flavourful and my favourite of the four appetizers we had ordered. When it comes to the main dishes the menu has five different options, where one is a vegetarian pasta and the remainder feature local proteins. My boyfriend opted for the Manitoba Pickerel ($24) with scallops, clams, zucchini, fennel, and potatoes cooked in a gin and tomato broth. The fish was fresh and cooked nicely, and the flavours didn't overpower the fish itself. 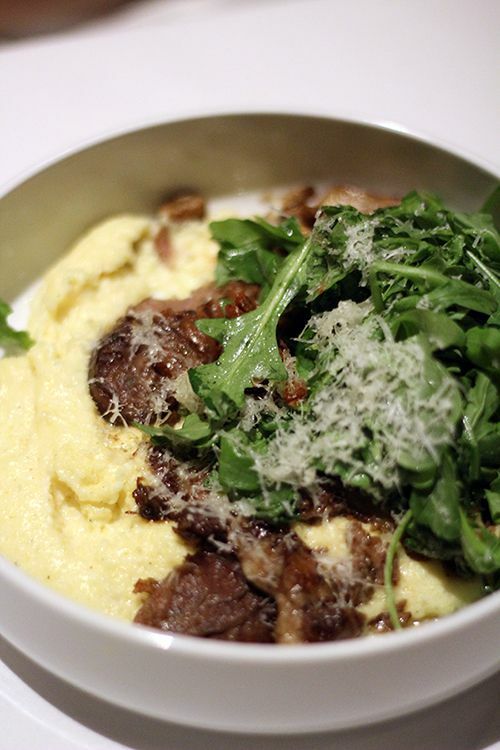 Another dish at our table was the Pembina Pork Cheeks ($24) cooked with wild mushrooms and served on a bed of buttermilk polenta with arugula, tomato jam and pecorino. The pork was fall-apart tender and the polenta was light and creamy. It was a great dish with balanced flavours. For myself I had the Duck Breast ($28), because any time there's duck involved, it's mine! 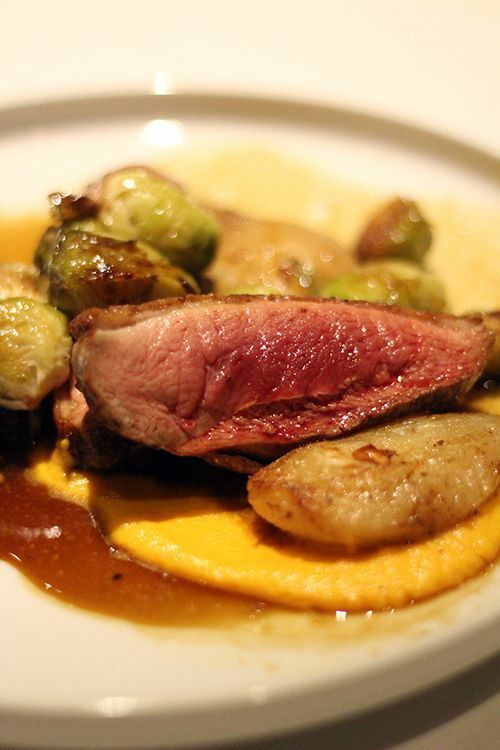 Two beautiful pieces of duck breast sat atop a carrot puree with brussels sprouts and roasted pears. Unfortunately mine had been overcooked, but the kitchen had no problem replacing it. The second plate's duck was beautiful - medium rare, and seared off with a nice crisp skin. The duck was delicious, but even better was the roasted brussels sprouts. They were flavourful, not over cooked, and I could not stop eating them. This was definitely the star of the night for me, and I wouldn't hesitate to order it again. 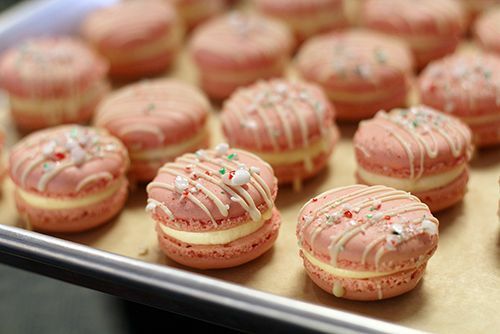 Pastry Chef Kai Wong has brought together a great selection of desserts. 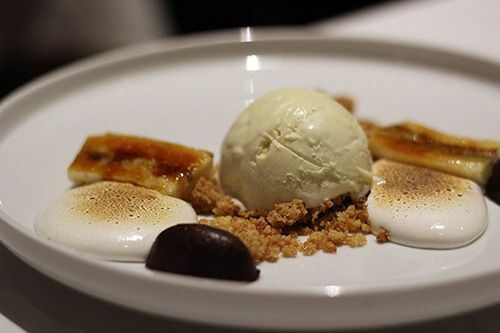 Of the five options, there was one calling my name - namely, the Alberta Hotel Banana S'mores ($12). Chocolate ganache, graham crumbs, bruleed banana, whipped marshmallow, and a scoop of housemade banana ice cream were presented beautifully in a deconstructed manner on the plate. Deconstructed plating can be hit or miss, but this dessert was fantastic. Eaten together or separately, every component was delicious, but I was partial to the ice cream. While there were some hits and misses throughout the evening, we noticed that there was a lack of consistency from one table to the next. A dish could be underseasoned at one table while the same dish was heavily seasoned at the next. Even more interesting was that two of the same dish being ordered at one table could taste completely different. It was evident on the night of our visit that the kitchen was lacking consistency, which was unfortunate given that the kitchen had been practicing for over three weeks. 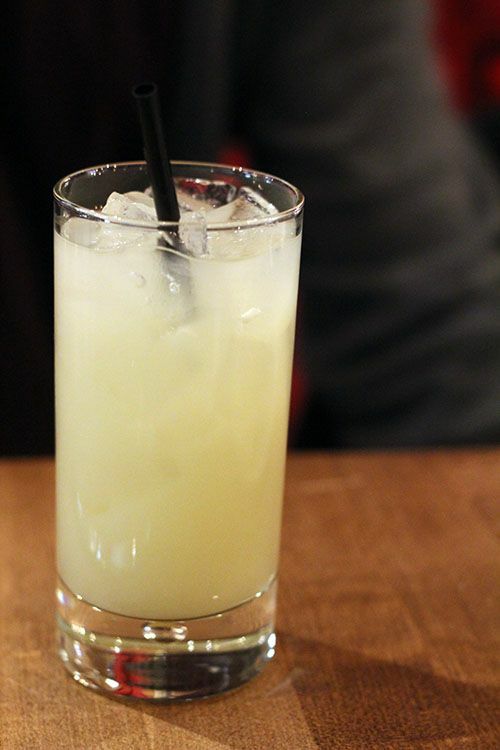 The Alberta Hotel Bar + Kitchen has huge potential in becoming a strong name in the Edmonton food scene. As a big supporter of local producers, I do hope to see them succeed and strive for consistency in their dishes. While I won't be rushing back for a visit, I'm eager to return for another bite of that duck breast in the future. A big thanks to all my food-loving friends that came out to celebrate my birthday - life would be less calorically dense without you! What do beets, carrots and parsnips have in common? 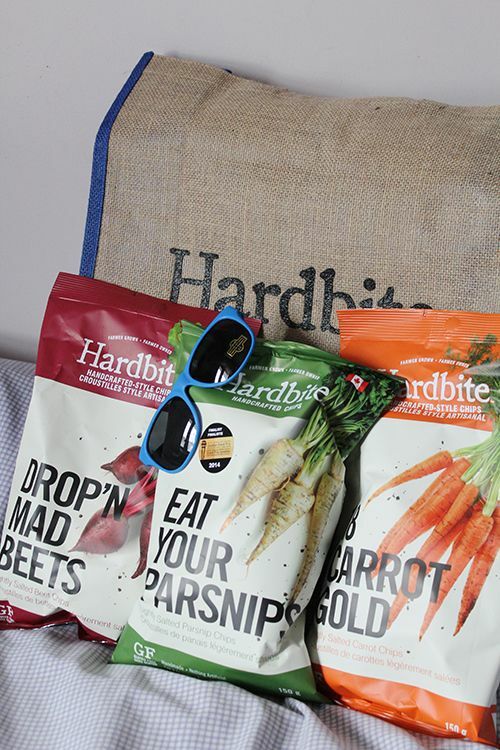 Sure, they're all root vegetables, but they're also part of the exotic line of root vegetable chips made by Hardbite! You've probably seen Hardbite Chips in your local grocery stores. Their crunchy chips are found inside unique black bags decorated with images of distinct landmarks in British Columbia, Canada. Why BC? 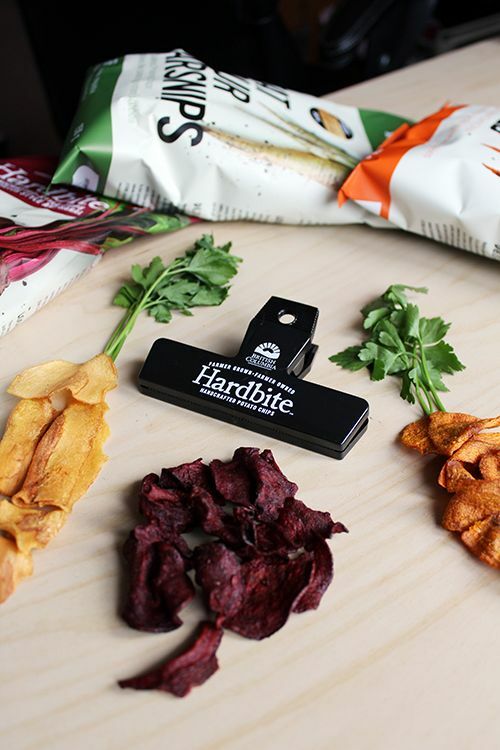 Because Hardbite is produced out of Maple Ridge, from potatoes and root vegetables sourced from local farmers in the area. Their snacks are a wonderful Canadian product, and even received support from some of the Dragons on Dragons' Den. 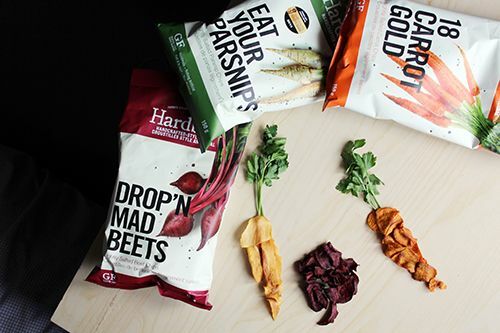 After a successful launch of their Parsnip Chips, Hardbite introduced their beet and carrot chips this fall. 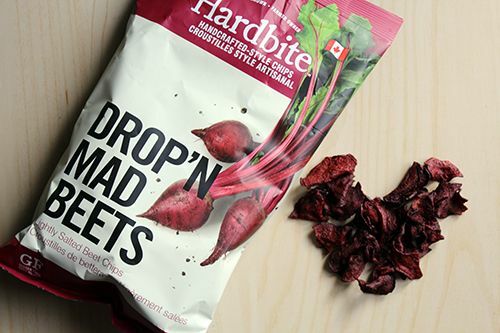 Drop'N Mad Beets beet chips are a beautiful crimson red colour, and being lightly salted they are a sweet and savoury chip. 18 Carrot Gold carrot chips are golden orange and have a distinct, slightly sweet carrot flavour. All natural - each chip bag has a short list of ingredients that you will recognize! What I love about these chips is that you can taste the natural flavour of the vegetables in the chip. The chips are processed in small batches and hand-turned to ensure the highest quality. And given that the chips are made from root vegetables, they're a low carb, guilt-free snack! If you don't like vegetables, at least you can get some of your daily vegetable servings in chip form. Of the three flavours, Drop'N Mad Beets is my favourite - I love the earthy sweetness of the beets! Each bag of chips comes in a 150g size and can be found at many grocery stores across Canada and the US. To find these chips near you, you can use the store locator here. 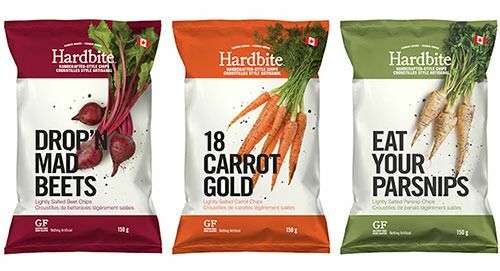 In the spirit of the holiday season, Hardbite has offered one of my readers the opportunity to try these new root vegetable chips! Check out the full giveaway details below, this giveaway is open to all my Canadian readers. 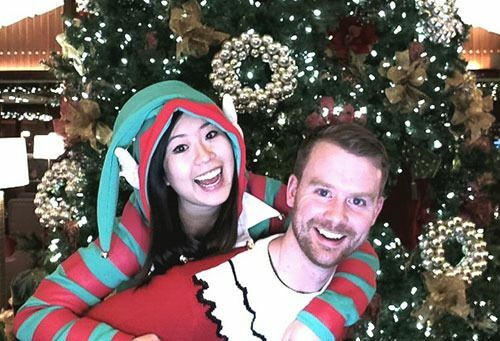 Happy holidays and happy snacking! Mandatory Entry: To enter, tell me what your favourite root vegetable is by commenting on this post! Please make sure you leave a valid email address in the giveaway widget as this is how I will be contacting you. This giveaway is open to anyone 18+ years of age in Canada. 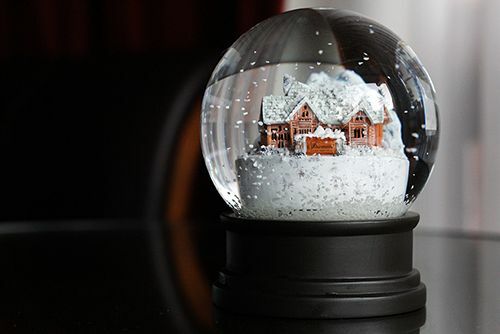 You have until December 18th to enter and the winner will be selected by random and be contacted via email. Good luck! As soon as the cold weather comes around I hunt for skincare products that will keep my skin happy in the winter. I tend to struggle with dry skin not only due to the weather, but also due to the dry air in the environment that I work in (hospitals are sooo dry). I was recently introduced to the product line by Rodan + Fields, a California-based skin-care line developed by dermatologists Dr. Katie Rodan and Dr. Kathy Fields. These two doctors also created the well-known line of Proactiv skincare products. Rodan + Fields products aim to target specific skincare problems: reduction of lines, restoration of firmness, targeting dullness and discolouration, acne, and post-acne scarring. Rodan + Fields skincare products had their start in high-end department stores, but the founders ultimately pulled their product and went into direct selling through independent consultants. This American skincare brand has started to make their way into the Canadian market, and I was given the opportunity to give the Microdermabrasion Paste and Night Renewing Serum a try. During the winter months my skin relies on a combination of exfoliants, serums, and creams to stay soft and hydrated. 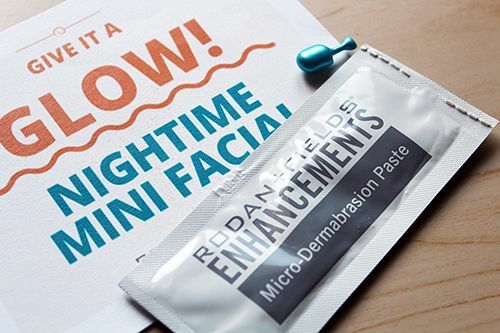 The Rodan + Fields Microdermabrasion Paste is formulated with a mix of salt and sugar crystals, vitamin C, and vitamin E. The consistency is similar to most scrubs, but the formula has an oily base which allows it to glide smoothly on the skin. The company recommends using the scrub on dry skin, but I felt that was too intense and added a small amount of water. After massaging for one minute, my skin was incredibly smooth and hydrated! You don't need to use a lot of paste to get nice results, and I would probably stick to using this product once a week (compared to their recommendation of 1-3 times per week). The serum comes packaged in individual capsules, and is formulated with a blend of peptides and retinol to visibly improve skin texture, firmness and reduce the appearance of wrinkles. The serum is quite different from those I've used in the past, as it is less of a liquid and is very lightweight. This is likely due to the presence of silicone the formula. As I had only one sample I cannot speak to the long-term promises of the serum, but I did feel that my skin was very smooth the morning after! 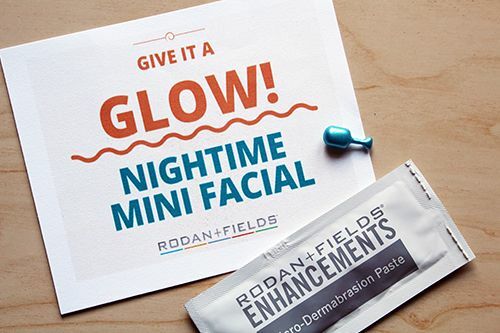 While Rodan + Fields products are on the pricier side, the combination of the Microdermabrasion Paste and Night Renewal serum can act as as a budget friendly mini facial at home. 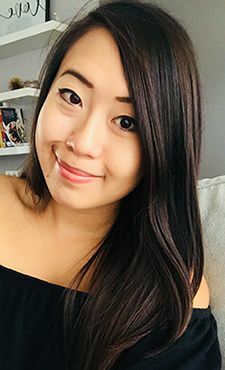 If you're interested in the products, get in touch with Edmonton-based consultant Bianca! *Disclosure: This product was sent for consideration of a review. Views expressed in this post are solely mine. This post is 100% my opinion, and as always, my priority is to you, the reader, to present an unbiased, thorough review.